It was Benjamin Franklin who set me on the path to write Chains. Benjamin Franklin held people in slavery his entire adult life. This shocked me. I knew about the slaves of Jefferson and Washington, but Ben Franklin? I loved Franklin, I adored him. How could he own slaves? This rocked me to my core. I realized that I did not understand the extent of slavery in colonial America. I spent years rummaging through archives, visiting museums, and pestering historians with relentless questions. In the beginning I was disillusioned and disheartened. I am a proud and patriotic American and I could not reconcile my love of country and admiration for the Founding Fathers with the fact that so many of them owned people who had been kidnapped from their homes in Africa, or were descended from people who had been kidnapped. Because it wasn’t just Franklin. Ten of our first twelve presidents owned slaves, the notable exceptions being John Adams and his son, John Quincy Adams. Interestingly, Abigail Adams grew up in a slave-owning household. Her father, Rev. William Smith, owned at least two African Americans: Pheby and Tom. Aaron Burr was a slave owner, as were generals Philip Schuyler and Horatio Gates, first chief justice of the United States John Jay, the famous artist Charles Willson Peale, and one-third of the members of the Continental Congress. In 1776, while the rhetoric of freedom and liberty was thick in the air of Boston, Providence, New York, Albany, Baltimore, Philadelphia, Williamsburg, and Charleston, fully 20 percent of the population of the newly christened United American States — one in five — were owned as property and sold like cattle. Uncovering this bewildered me and made me sick to my stomach. As I researched I began to hear my main character, Isabel, whispering to me. She was chained between two nations. The British promised freedom to any slave who fled to British lines, with one exception — slaves owned by Loyalists would be returned to their owners. The Patriots talked a good game about freedom, but few were willing to extend that inalienable right to people of color. Isabel is the heart of America, yearning for the promise of our Revolution, but attacked at every turn by hatred and ignorance. She is the property of wealthy Loyalists in New York City, watching as Washington’s troops falter and the city is turned into a stronghold of the Crown. Isabel must negotiate the daily chores of a slave, the challenges of a shifting political landscape, and the dangers of a battle zone. Above all, she must find a way to rescue her little sister, who was sold away from her. Working on this book eventually made me hopeful. My melancholy about the poisonous effects of slavery lifted as I understood that people like Isabel and her friend Curzon were the real Americans, the quiet ones who fought battles every day and grew stronger in the face of resistance. They were willing to risk everything for liberty, knowing that it is better to die fighting than to live in chains. But it is best to live free, in a world where we are all valued, in the world that our Founding Fathers and Mothers dreamed of, even if they weren’t brave enough to make the journey in their lifetimes. Slavery affects all Americans today, regardless of ethnic background, or how long our families have lived here. Slavery is the elephant in our country’s living room. It won’t go away until we acknowledge, understand, and deal with it. 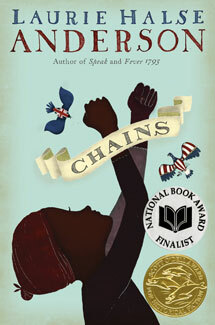 I hope that Isabel’s story will help young readers break free of the chains of ignorance and misunderstanding. I pray they will be strong enough to move our country forward to empathy and healing, and finally allow America to fulfill the precious dream of liberty and justice for all.